After stumbling upon this Vice article which explores the possible hypocrisy of the apparel we wear to support causes such as planned parenthood or to proclaim our support of the feminist movement – clothes that at once deem us “woke” but also have cast shadows of doubt when no one asks “where” and “how” these items were made. I want to assure you that all of our bags are made at factories that meet and exceed fair wage and fair labor practices as well as safety standards. We are certified FLSA and SA 8000. The majority of our factory employees are women – women who are valued in the workplace, compensated well above minimum wages and who have ample holiday and vacation time off. Children did not make your bag. The people in it work in a safe work environment and they make a livable wage. In addition to this we are a woman owned business and the majority of the employees (hi!) that work in our office are women. We work to empower women all over the world, and in all social and economic circumstances. If you are a non-profit or are seeking to design apparel with proceeds that go towards a cause, you should work with a company whose values align with your own. You can be sure that here at Eco-Bags Products we support women, we support the right to a living wage – no matter where in the world you live, and we also support the protection of our environment. 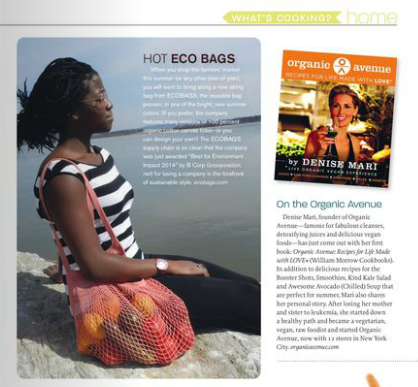 3 Reasons Why We Love Organic Spa Magazine! Did you pick up this month’s Organic Spa Magazine? Here are 3 Reasons Why We Love Organic Spa Magazine! The products! Can’t make it to the spa? Check out some of the various creams, oils, lotions, and more to pamper yourself and your loved ones! The food! So delicious looking and made with natural ingredients — the seafood paella, the blackberry sorbet… we want it ALL! Have you purchased this month’s Organic Spa Magazine? Check out page 23 for our feature! Did you miss the news last week? Eco-Bags Products made the 2014 B Corp Best for the Environment list again! That means that we and the other ‘Best for the World’ businesses earned a score in the top 10% of all Certified B Corporations for environmental impact, signifying your leadership in a community of businesses creating the most overall positive impact. B THE CHANGE! Dina Lerman, Bugged Out, has been a vendor since Aliana Marino introduced Bugged Out to Eco-Bags Products back in 2009. Bugged Out is a special type of business — Dina has a personal story with MS (multiple sclerosis), having started the company in 2007 with her bug line, which had its origin in MS Walk team T-shirts. We’ve been successfully selling Bugged Out to both retail and wholesale audiences for years. For the first time, Bugged Out will be printing their designs on the ECOBAGS CANR-501B (100% Recycled Cotton Reusable Shopping Bag). 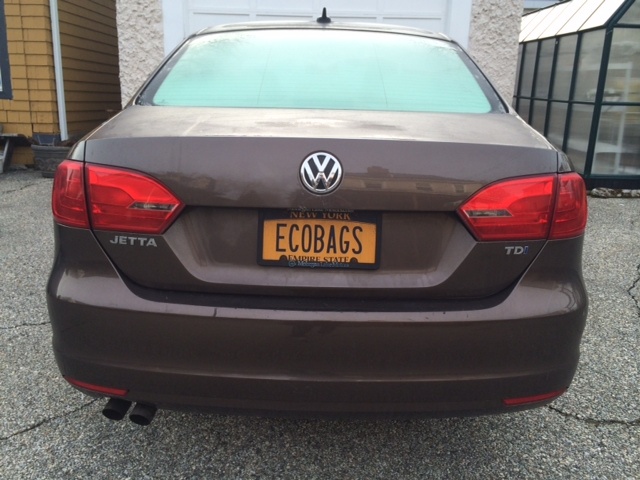 The ability to publically associate the Bugged Out brand with the ECOBAGS brand is a win-win for all. Most of all, it is an honor to be associated with the work that Dina is doing on behalf of MS (A percentage of the proceeds from Bugged Out sales goes directly to Multiple Sclerosis research at the MS Care Center of NYU Langone Medical Center).